I think a huge part of the reason that our family tradition of excess wasn’t “damaging” is because it was all centered around my father. You see, we never incurred extra debt for Christmas, even though we weren’t financially well off. We weren’t receiving welfare or assistance or anything, but we weren’t “rich people.” My father was caretaker for about half a dozen acres owned by Canadian families in my neighborhood, and they all paid my father for his year of services when they came in to town in October and November. That money was Christmas money. He worked all year, and he worked hard on top of his regular job as a roofing construction foreman, just to pay for the kind of Christmas that he wanted to have. 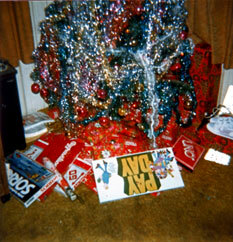 Christmas tree with presents, circa 1980. Excess wasn’t just presents. The outside of our house was always decorated. He’d climb our big huge sycamore trees in the front yard and string lights. One year, he mounted an old artificial Christmas tree to the roof of his workshop and decorated the heck out of that. And the inside? Well, our tree was just… Yeah, even our Christmas tree was excessively decorated. We used to joke about how putting on all eleventy billion ropes of garland on the tree was “hog tying the Christmas tree.” Another standing joke was that by the time our tree was done being decorated, you couldn’t see the tree underneath. And, yeah, that was all my dad’s doing. Yes, we’d help, but he was the one who ultimately decided when the tree had enough stuff on it. And under it. Food was also excessive. My father would buy the biggest turkey that he could find, and everyone in the family went home with enough leftovers for three or four days. It took my mother three days to make all of the pies that were made. On Christmas morning, after presents were opened, he’d make a trip around the neighborhood for morning coffee with his friends and he’d bring over a pie for each house that he’d visited. Were gifts excessive? Absolutely. My mother’s work was seasonal, and during the month of December, it was not unheard of for her to pack in 90 hours a week, and then work would shut down the week before Christmas. But the fun was in the excess and my father’s excitement around it. His enthusiasm for Christmas was contagious. The excess wasn’t out of greed; it was out of enthusiasm and excitement over the holiday season. That’s what I want to pass on to my kids. Now if only I could get my husband on board with the excess…. What crazy Christmas traditions did you grow up with?